GoodReads Summary: Kyla is in danger from both the government Lorders who erased her memory and the terrorists who tried to use her. So now she’s on the run. Sporting a new identity and desperate to fill in the blank spaces of her life pre-Slating, Kyla heads to a remote mountain town to try to reunite with the birth mother she was kidnapped from as a child. There she is hoping all the pieces of her life will come together and she can finally take charge of her own future. But even in the idyllic wilderness and the heart of her original family, Kyla realizes there is no escape from the oppressive Lorders. Someone close to her may be one of them, and even more frighteningly, her birth mother has been keeping secrets of her own. As far as conclusions to trilogies go Shattered was a good one. Kyla is still wound up about what happened to Ben, and although I felt sorry for her I wasn't actually too bothered about Ben. Why? Because I wasn't emotionally invested in the romance between Ben and Kyla in book one. It was dull and so was Ben to be honest. For this reason, as harsh as it may sound to some, I didn't really care much about what happened to him. I was, however, pleased with the way Aiden and Kyla's relationship evolved. *highlight to read spoiler* He was the guy I was rooting for as a love interest, and although Kyla was pretty much oblivious to his feelings until the very end I am glad that the book hinted at a future for the two of them. One thing I appreciated about Aiden was that he completely supported Kyla, without being pushy or condescending. In contrast to Ben, he was a fully developed character. Many of the long awaited answers to questions readers have dying to know are answered in this book. Kyla's journey of self discovery continues and she finally learns the truth about her past. If there was only one thing I could say about this book it would be that there is no lack of character development on the part of the mc. She grows and grows, coming out stronger in the end. Furthermore, Terry's writing style really adds to the horrors of what goes down in this book, adding tension and edge to the story. The freakiest thing about this trilogy is that it seems realistic, like the events that took place could actually happen. In an overcrowded genre, Slated is a unique dystopian trilogy. So glad you were happy with the way this ended. I have been meaning to pick this trilogy up for a while now but I kind of like to wait until all books are out before I do so I can see reviews for that last book. I hate it when they end badly. I remember thinking that about the first book - that the world is realistic enough to easily one day be our own. The romance never really did much for me either, but I'm curious about Aiden's character and look forward to finding out more about him. I still need to read book two, but it's reassuring to see that the trilogy wraps up well overall. Great review, Renu! that's great you appreciated the ending! that seems rare these days in series. I haven't read these books, but they do seem interesting! I know how much you love this trilogy, Renu, but I still haven't gotten around to starting it. Your last sentence of the review sold this series to me though. Hopefully, I can begin the first book once my TBR pile becomes a little smaller. I keep seeing this series, but I haven't picked it up. I liked that it ends well and that it keeps that frightening, realistic feel to it, those are the best kinds of dystopians, I think. So happy to see a satisfying conclusion to a dystopian trilogy! I wonder what Kyla's mom was hiding... Thanks for sharing that you found the characters Aiden and Kyla well-developed. Loved your review, Renu! Oh my goodness, I can't believe it's been so long that this series is now finished! 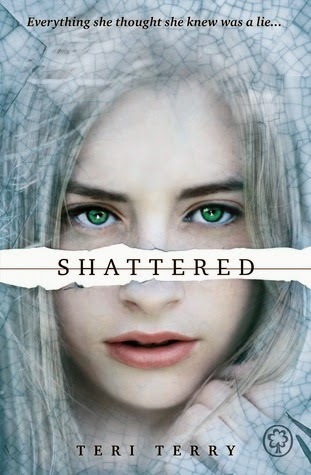 I've had Shattered on my shelf for ages and still have not read it - oops! So glad the series ends well, I will definitely catch up now! I really LOVED Slated, so I really hope I find the time to continue on with the series! I'm glad it wrapped up nicely though!! Great review, Renu! I haven't read the previous books yet, but I am really looking forward to reading the series. I didn't know that Ben dies... but I guess doing so now will help me be even less emotionally invested in this death... Of course that didn't help with Tris in Allegiant, but oh well! Yay! I'm glad that you were pleased with how this series ended, Renu. I am planning to read this series, because I've heard endless praise for the trilogy. I used to read every dystopian that was out but started getting sick of them after the same tropes kept on appearing. So I'm glad to hear your view that this series is still a unique dystopian. Thanks for the review! I want to read this trilogy, but always go back and forth about it. I need to be in just the right mood. Glad it ended well. Interesting -- I've only read Slated. I didn't like Ben, so the fact that she has a new guy is a plus for me!